Nasser Al Salem, Guide Us Upon The Straight Path, 2013. Video on EKG monitor. Nasser Al Salem (Saudi Arabia) works with the Arabic written word. His practice pushes the boundaries of the age-old Islamic art of calligraphy by re-inventing it in non-conventional mixed media forms and by exploring its conceptual potential. Born in Mecca in 1984, his family’s trade was tent-making so Nasser spent much of his childhood helping his family sell tents to pilgrims who came to Mecca for the Hajj. Later he studied architecture at Um Al-Kora University in Mecca, and he currently lives and works as an architect in Jeddah. Nasser also holds an Ijaza qualification in calligraphy. 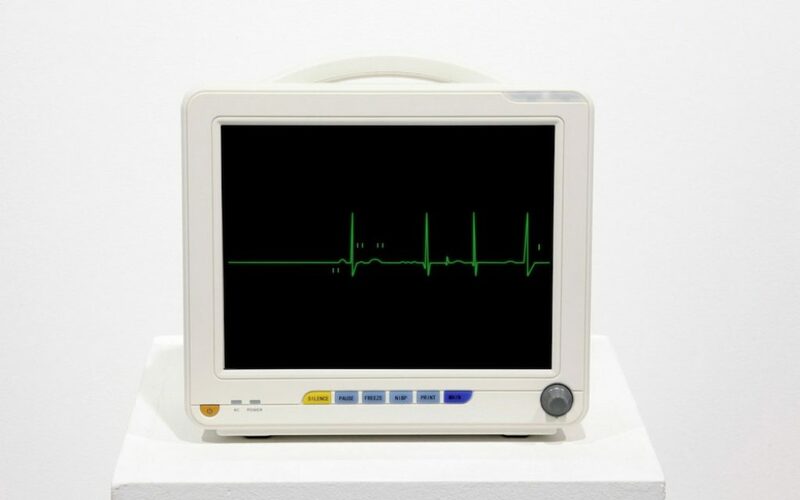 In 2012 Nasser had a solo show at Athr Gallery, Jeddah, titled, And It Remains…. He has exhibited internationally in group shows including: Common Grounds, Villa Stuck Museum, Munich (2015); Hajj: The Pilgramage to Mecca, Institut Du Monde Arabe, Paris (2014); Edge of Arabia: We Need to Talk, Jeddah (2012); Hajj, British Museum, London (2012). Awards include: a nomination for the Prudential Eye Awards (2015); being shortlisted for the Jameel Prize (2013); awarded second prize in the Saudi Arabia’s national calligraphy competition (2010). His work is included in the collections of The British Museum, LACMA, and Centre Pompidou among others. Nasser is a member of the National Guild of Calligraphers and is an active member of Saudi Arabia’s Arts and Culture Group. He is actively involved in community calligraphy projects. Nasser was previously in residence at Delfina Foundation in August 2014. Delfina Foundation’s family of supporters and those who wish to remain anonymous. Please note all artist-in-residence biographies are accurate at the time of their residency. For up-to-date bios please visit the artist’s website.